Another entertaining but rather tiring afternoon in good company watching a movie almost three hours in running time plus another 40 minutes of ads, trailers etc. For all that, it was enjoyable and the post movie chaat session at the food court in the mall was icing on the cake. The movie is almost entirely shot on a cruise ship but most of the action has little to offer in terms of sharing what a cruise ship can offer. Seeing Istanbul on the screen took me back to my two visits there in the late nineties and that too was part of the enjoyment. 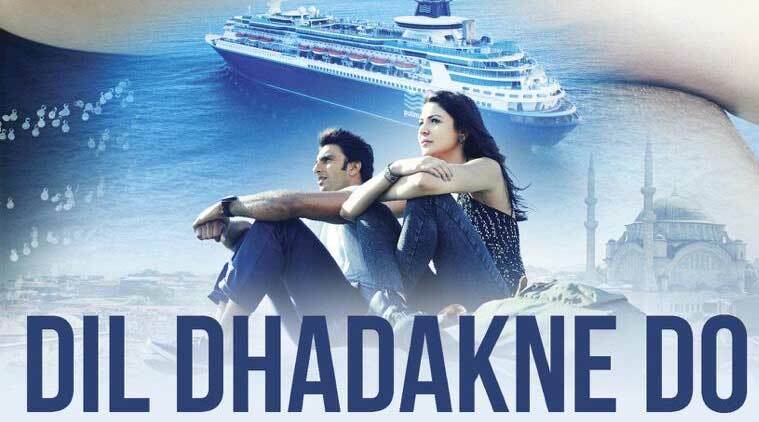 Dil Dhadakne Do, meaning, Let The Heart Beat revolves around relationships at various levels and all portrayed with sensitivity and brutal honesty. Husband and wife, young man and woman, business rivals, employer / employee, siblings, and so on all packed into a very believable story, all cumulating to a rather impossible climax but for Bollywood standards, very possible. I kept thinking about how better editing could have reduced the viewing time, and could not come up with even one scene which could have been eliminated. Big, new and some rather new Bollywood names and faces bring the story alive and impossible situations are brought alive realistically by some excellent direction. Throw in a dog to add a bit of masala, and you have someone like me drooling! If you can spend almost three hours viewing time plus other inside theater time of about 40 minutes, you can invest that in watching this film to which I give[rating=6] rating. This entry was posted in Family, Movies, Nostalgia, Relationships and tagged Cruise ship, Istanbul. Bookmark the permalink. 4 Responses to Dil Dhadakne Do. It sounds a bit long for me, but I’m glad you enjoyed it. I’ve been watching Top Chef, about cooking competitions. They have enough action to keep me bouncing on my little trampoline. I hate to sit. The length is manageable except that at my age, I would have preferred two intermissions! Funny but a trip to the theater used to be 3 hour or more with double fetures and cartoons. Now anything over 90 minutes seems like an epic. Age my friend age. The number of intermissions need to be two if the movie is longer than 90 minutes for oldies like me!